Robert Dobel was born in Yeales Green, Wiltshire, in 1808 but by 1830 he was living in Yeovil. He was married to Elizabeth Tucker at St John's church on 10 November 1830 and this same year Pigot's Directory listed him as a "Watch & Clock Maker of Middle Street". Robert and Elizabeth were members of the Baptist Chapel in South Street and their son was baptised there. In the autumn of 1837 Elizabeth died and in the spring of the following year Robert married Mary Ann Hardy at St John's church. 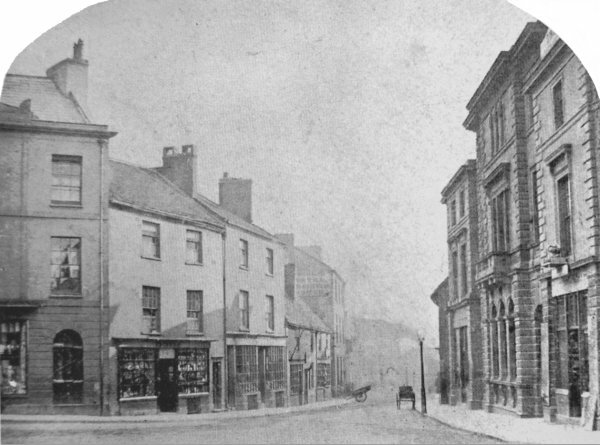 Robert was listed as a "Watch & Clock Maker of Middle Street" in the Somerset Gazette Directory of 1840. In the 1841 census he was listed as living with his new wife Mary (b1815), children John Tucker (b1831), Ellen (b1835) and William (b1839) and a female servant in Hendford (actually No 1 Hendford - see Gallery below) on the corner of High Street. 35-year old Robert gave his occupation as a Jeweller. In 1843 Robert and Mary had a son, Frederick, but by the time of the 1851 census Mary had died and Robert was listed as a widower. He was still living in Hendford, with children John, Ellen and Frederick and a domestic servant. Robert gave his occupation as a Silversmith and both John and Ellen were listed as his Assistants. Both Hunt & Co's Directory of 1850 and Slater's Directory of 1852 listed Robert as a "Watch & Clock Maker, Silversmith, of the Borough" indicating a move of workshop / shop premises. 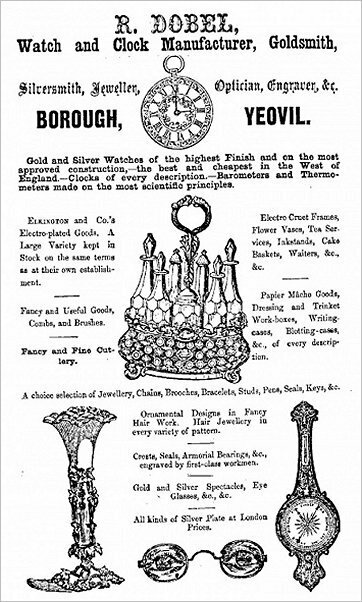 In an advertisement of 1859 (shown below) he described himself as "Watch and Clock Manufacturer, Goldsmith, Silversmith, Jeweller, Optician, Engraver, Etc". From the Ilchester Churchwardens Accounts Robert Dobel was paid various amounts ranging from 12s 6d to £3 for repairing the clock between 1837 and 1848.
the Kingsdon Churchwardens Accounts noted in 1841 "Mr Dobuls Bill for the clock £8 10s" and he was paid £10 per annum for maintaining the clock between 1843 and 1855.
the Ditcheat Churchwardens Accounts recorded in 1856 "Doble towards the Clock £2 0s 0d" and "Remaining part of Doble's bill towards the Clock £1 15s 6d". In 1857 "Doble for the Church Clock £1 8s 6d" and in 1858 "Doble for work done to the church clock £4 10s 0d". In the 1861 census 53-year old Robert and 19-year old Frederick, together with a domestic servant, were listed at Hendford and both father and son gave their occupations as Jewellers. Robert Dobel died in the spring of 1868 aged 61. His business was carried on by Frederick until around 1900. 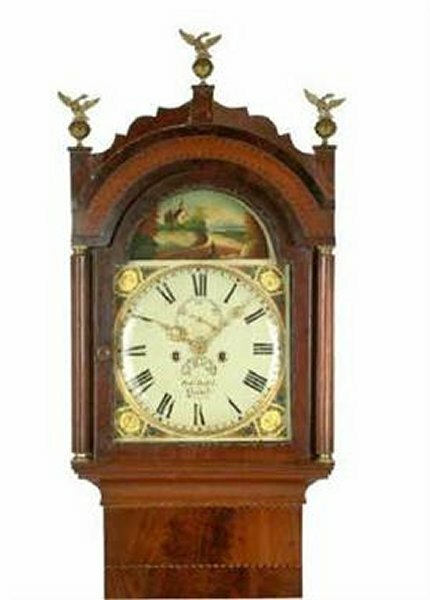 Above left is an example of a flame mahogany grandfather clock made by Robert Dobel. 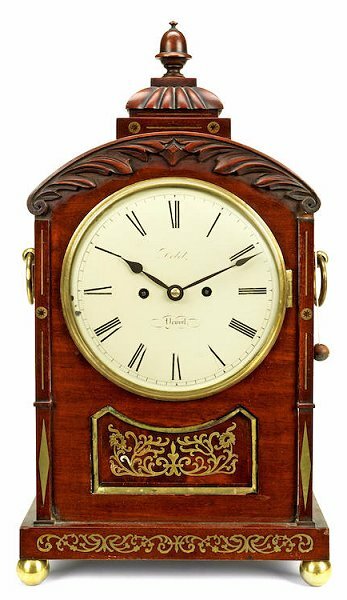 A George IV (1820-1830) mahogany and brass inlaid bracket / table clock with repeat, made by Robert Dobel. Valued today at around £2,000. 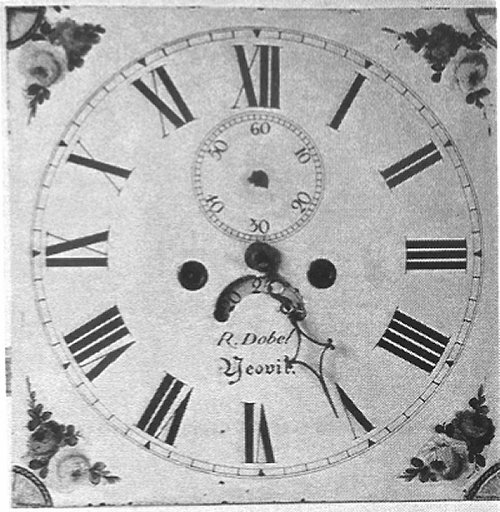 The upper part of a mahogany longcase clock by Robert Dobel. 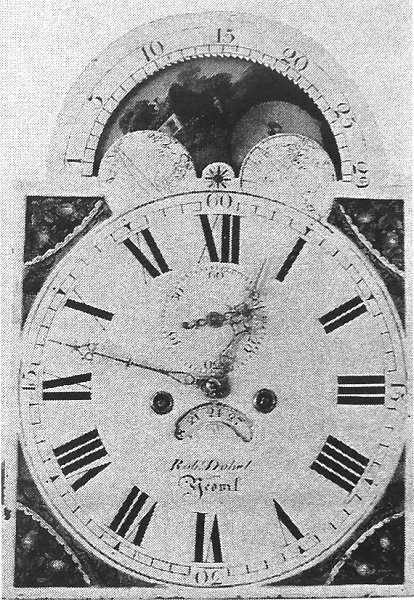 The dial is cream painted and the case is inlaid with feather chequered stringing and the waist door is flanked by fluted quadrants with metal caps and feet. Overall the clock stands 88" (224cm) high. 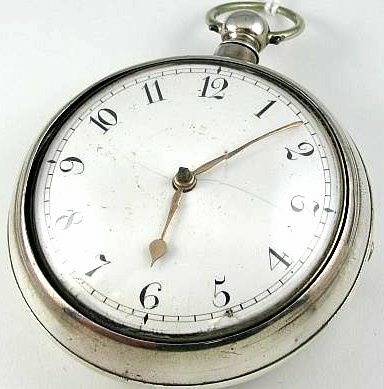 A William IV (1830-1837) silver open-face pocket watch with a keywind fusee chain movement and marked "Dobell, Yeovil". An early 19th century oak 8-day striking longcase clock with a painted dial by Robert Dobel. A rosewood stick barometer, the bone register plate signed "Dobel, Yeovil", flanked by vernier and thermometer in a plain arched case with turned urn-shaped cistern cover. 36" (92cm) high. 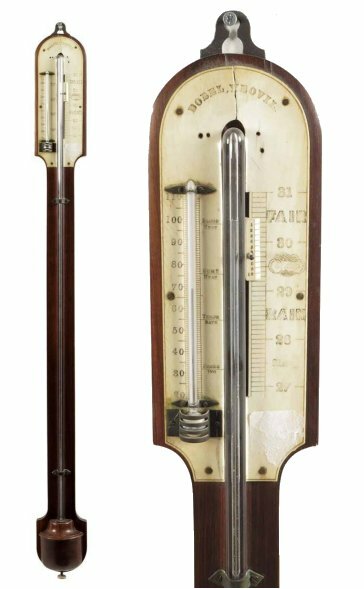 This barometer was auctioned in 2014, selling for £180. A very descriptive advertisement placed by Robert Dobel in several editions of the Western Flying Post during December 1852. As an idea of prices, £1 in 1852 would be worth just under £100 at today's value. An advertisement for Robert Dobell dating to 1859 at which time his shop premises were in the Borough. He described himself as "Watch and Clock Manufacturer, Goldsmith, Silversmith, Jeweller, Optician, Engraver, Etc". Another clock face signed R Dobel of Yeovil. And a final example signed Robt Dobel, Yeovil.